In the midst of a major capacity upgrade, the Port of Tórshavn is extending threefold the industrial harbor at Sund—while boosting East Harbour docking space and tripling available storage there to accommodate rapidly rising traffic. Developments at the Port of Tórshavn have accelerated to unprecedented levels even as Faroese seafood exports alongside imports of construction materials and consumer goods hit an all-time high in 2017. 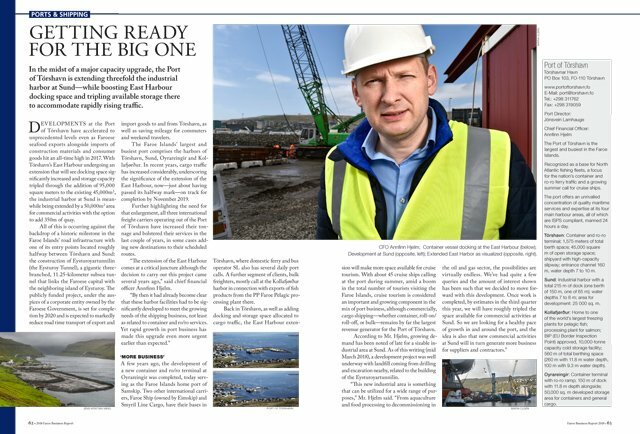 With Tórshavn’s East Harbour undergoing an extension that will see docking space significantly increased and storage capacity tripled through the addition of 95,000 square meters to the existing 45,000m2, the industrial harbor at Sund is meanwhile being extended by a 50,000m2 area for commercial activities with the option to add 350m of quay. All of this is occurring against the backdrop of a historic milestone in the Faroe Islands’ road infrastructure with one of its entry points located roughly halfway between Tórshavn and Sund: the construction of Eysturoyartunnilin (the Eysturoy Tunnel), a gigantic three-branched, 11.25-kilometer subsea tunnel that links the Faroese capital with the neighboring island of Eysturoy. The publicly funded project, under the auspices of a corporate entity owned by the Faroese Government, is set for completion by 2020 and is expected to markedly reduce road time transport of export and import goods to and from Tórshavn, as well as saving mileage for commuters and weekend travelers. The Faroe Islands’ largest and busiest port comprises the harbors of Tórshavn, Sund, Oyrareingir and Kollafjørður. In recent years, cargo traffic has increased considerably, underscoring the significance of the extension of the East Harbour, now—just about having passed its halfway mark—on track for completion by November 2019. Further highlighting the need for that enlargement, all three international freight carriers operating out of the Port of Tórshavn have increased their tonnage and bolstered their services in the last couple of years, in some cases adding new destinations to their scheduled routes. “The extension of the East Harbour comes at a critical juncture although the decision to carry out this project came several years ago,” said chief financial officer Annfinn Hjelm. A few years ago, the development of a new container and ro/ro terminal at Oyrareingir was completed, today serving as the Faroe Islands home port of Samskip. Two other international carriers, Faroe Ship (owned by Eimskip) and Smyril Line Cargo, have their bases in Tórshavn, where domestic ferry and bus operator SL also has several daily port calls. A further segment of clients, bulk freighters, mostly call at the Kollafjørður harbor in connection with exports of fish products from the PP Faroe Pelagic processing plant there. Back in Tórshavn, as well as adding docking and storage space allocated to cargo traffic, the East Harbour extension will make more space available for cruise tourism. With about 45 cruise ships calling at the port during summer, amid a boom in the total number of tourists visiting the Faroe Islands, cruise tourism is considered an important and growing component in the mix of port business, although commercially, cargo shipping—whether container, roll-on/roll-off, or bulk—remains by far the largest revenue generator for the Port of Tórshavn. According to Mr. Hjelm, growing demand has been noted of late for a sizable industrial area at Sund. As of this writing (mid March 2018), a development project was well underway with landfill coming from drilling and excavation nearby, related to the building of the Eysturoyartunnilin.